Wow, a lot happens in two weeks. May need to shift back to weekly posts. Anyway, here’s an attempt to synthesize the past 14 days of the epidemic, with an emphasis on epidemiology and mathematical modelling. Enjoy, and as ever, any and all comments welcome. It’s difficult to say anything here with certainty. I’m hearing mixed reports and even the trend in quality is hard to discern. We may well be beyond the point of tracking how things are going, unless and until the epidemic peaks out. I don’t mean to be unduly pessimistic, but that’s my overall impression. The reporting front. There are reports from Liberia that fewer cases are presenting at clinics, and indeed that there may be spare capacity. It remains unclear whether this is due to fewer cases occurring, less presentation for care, or even a mistaken impression. Similar stories are not being heard from elsewhere yet. Erik Reaves and colleagues report on the response to Ebola at the Firestone rubber plant in Liberia – including case finding, education and treatment modalities. First off, Caitlin Rivers‘ previously mentioned paper from the arXiv is now available at PLoS Currents Outbreaks. This provides empirical estimates on epidemic parameters and how interventions might improve matters (short answer, contact tracing and infection control will affect but not end the epidemic). I’d also note that the lab that produced that paper has provided synthetic individual-level country populations that include geography and typical contact structures; a phenomenal resource for those planning on modelling things. Second, Cameron Browne and colleagues consider how good contact tracing and isolation would need to be in each country to shut down the epidemic. The authors build both a Legrand-style SEIHFR model and a second model with two risk-levels for Susceptibles and Monitoring state that allows for contact tracing. For both Sierra Leone and Liberia, the model suggests the need to: (1) ensure that infectious cases not being contact-traced are found and isolated within 3 days of symptoms arising; and (2) that over half of those monitored (due to contact tracing or being high-risk, e.g. healthcare workers) are isolated without causing any secondary cases. (Browne paper). These two papers both start to get at the really important empirical questions of what level of success is needed to curb the epidemic. Third, Joseph Lewnard, Martial Ndeffo Mbah and colleagues have build an SEIRC model (C for deceased) with two infectious arms – one on a recovery trajectory, the other not. Calibrating the model to data for Monrovia and its surrounding county up to 23 September, the authors consider permutations of improved case finding, treatment centre expansion and home-care kit distribution. Of note, this paper estimates an R0 of 2.5 in this urban setting – notably higher than the nation-level figures seen previously, but in line with past single-point Ebola outbreaks. It also notes that current commitments to treatment (and the other interventions) are likely to be insufficient to stop the epidemic any time soon. (Lewnard/Mbah paper). In a commentary on the Lewnard/Mbah paper, David Fisman and Ashleigh Tuite, highlight the importance of early intervention, showing how every week of delay increases the total number of people affected – not only on the upswing of the epidemic, but also on the downswing – a result also foregrounded in the Lewnard/Mbah paper. A powerful reminder of the “steamroller” effect of the momentum that builds up as an epidemic expands. (Fisman editorial). And fourth, Maria Kiskowski has build the first model I’ve seen to incorporate community (and household) structure into the epidemic – something recently highlighted as potentially very important. The paper builds a synthetic, three-level population (households in communities in country) and then passes an SEIR Ebola epidemic across the network. Kiskowski’s results highlight the importance of saturation within units (houses, communities), and the jumps in infections that arise when Ebola comes into contact with new communities – notably, the recent resurgence in Guinea. (Kiskowski paper). Chiara Poletto and colleagues. This paper updates the Gomes work to include information on travel patterns/restrictions – either by governments or airlines – up to 31 August 2014. They then compare time to likely infection with and without restrictions. The authors provide a nice figure to show the impact of air travel bans in terms of reduced traffic and delay in time to first imported infection. Even with a considerable reduction in travel, delay in importation amounts to no more than one month. (Poletto paper; website with supporting material). 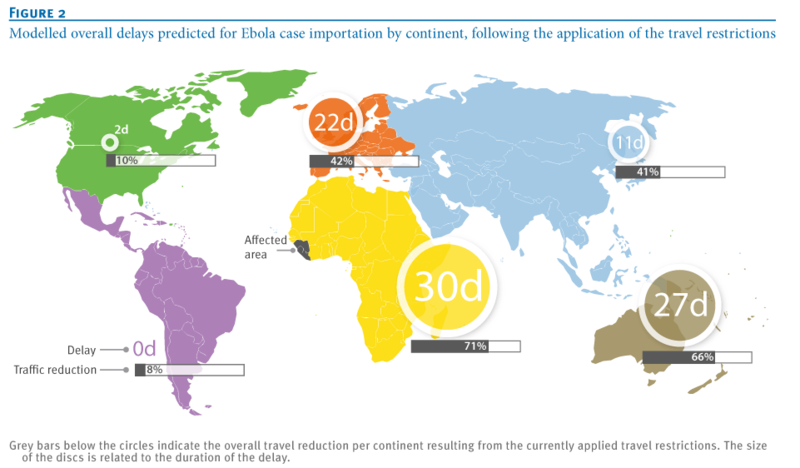 And another quick figure from the same team showing probability of 0,1,2,3,4 cases arriving in each country by the end of this month. The n remains small, but the CFR for completed illnesses in Europe/US now stands at 27% (4 of 15). On the other hand, rates in West Africa are getting increasingly difficult to determine, as resources continue to be stretched and the frequency/timeliness of reporting falls off. It may be lower than the ~70% previously thought, but it’s hard to say. Which is a shame, since knowing the gap between what is being achieved in SL/Liberia/Guinea and US/Europe would be useful in terms of understanding how much improvement can be expected as the response ramps up. 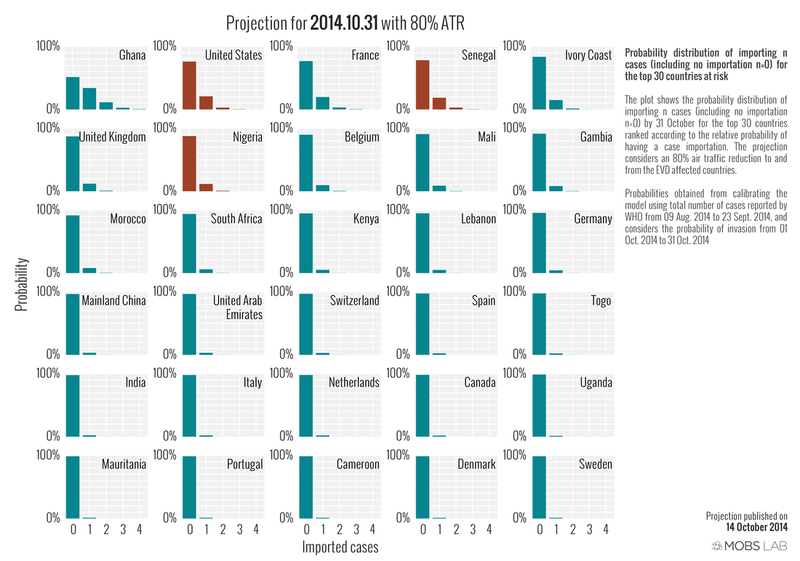 And West Africa’s current CFR would be a useful predictor of programmatic success. First, the range of the incubation period. Previously a maximum incubation period of 21 days has been considered sufficient for quarantine purposes, with little consideration of the tail of the incubation distribution. However, a recent paper by Charles Haas at Drexel, modelling data from multiple past epidemics and the WHO’s case series data from the West Africa outbreak, showed that between 0.2 and 12% of cases may have an incubation period over over 21 days, and thus might occur after the standard window of observation (or quarantine). This is in line with the 5% figure seen in the WHO’s NEJM paper. As Haas notes, a balance must be struck between the cost of quarantine and the cost of cases, so 21 days may be a perfectly reasonable period of observation. But modelling the tail of the incubation period is likely to be of interest as more contact tracing data becomes available. (Haas paper). Second, what proportion of infected persons ever become symptomatic. It was known that some proportion of West Africans carried antibodies to Ebola prior to this outbreak [Can someone remind me where I read this?]. However, a recent letter in the Lancet by Steve Bellan and colleagues noted that contact tracing data from previous epidemics suggested that 46% and 71% of seropositive contacts were not symptomatic. The authors then show in a simple model with 50% of cases were asymptomatic and gave protective immunity, epidemic size could be reduced by ~33% by early January due to herd immunity. While data to parametrize such models realistically is absent, this is an important issue to consider in modelling – and potentially a piece of good news. (Bellan letter). Third, what is the basic reproductive number? Previous estimates have ranged widely, but Erik Volz and Sergei Pond use 78 phylogenies from the early days of the epidemic (as provided in a previous analysis by Gile and colleagues). Using methods similar to, but distinct from, earlier work by Stadler et al., Volz and Pond estimate R0 to be somewhere around 3.5 in this sample. One notable divergence from the Stadler paper is this analysis’ finding of significant heterogeneity in secondary cases caused. The authors highlight variability in genetic structure as a possible source of this variation; I would look first to variation in the number of household members and funeral attendees across the 78 cases. But that may just be because I’m a social epidemiologist, and not a genetic epidemiologist: we all have our pet theories. (Volz paper). Someone has taken the data from the Humanitarian Data Exchange (HDX) and fed it through Google. The result: seriously impressive dataviz. Simon Johnson with the British Red Cross has put together some great dynamic figures, combining space and time. The two live Ebola dashboards are for OCHA 3W and IFRC. And for those of you interested in healthcare facilities, there are two options at HDX: one for general facilities (note different reporting standards across countries), the other for Ebola-specific locations. The latter is data only, it needs to be loaded into (Simon Johnson’s) mapping tool to work. Upshot, something like this. Treatment. About 10 days ago the UN, through its central Ebola body UNMEER (note they have daily SitReps), settled on a message of 70-70-60: 70% of Ebola-victim burials safely conducted, 70% infected people in treatment, within 60 days. I strongly imagine that the number 70 was based on the CDC Meltzer paper which modelled the impact of 70% control and showed it worked (as opposed to finding the marginal rate that would get R0<1). I haven’t heard much since then, but the building of new standalone Ebola treatment facilities continues apace. One treatment-related discussion that caught my eye on twitter was that relating to intravenous fluids use. My read of the situation: oral fluids are preferable when patients can take them, partly because very sick patients raise risk of needlestick injuries and bleeding from their IV entry point, and partly because without steady electricity supplies much of this work has to be performed in low-light environments. Vaccines. Vaccines (and new drug treatments) appear to be the next big hope for curbing the epidemic, despite reports that the most-advanced (GSK) candidate vaccine won’t be available at national scale until 2016. Nonetheless, there are now many products in development (nice – dynamically updated – overview here). There are ethical concerns about using placebos in randomized trials, and stepped wedge designs have been proposed as one alternative. Such trials are likely to be starting in the new year and ramped up by mid-Spring; although this speed of roll-out is new to everyone, so expect bumps along the way. It is worth bearing in mind, though, that if things aren’t somewhat under control by April 2015, then even highly effective vaccines/drugs are going to have limited impact (cf David Fisman’s argument above). Quarantine. There hasn’t been much new on this in West Africa. See below for debate elsewhere. Although given the arguments about incubation times above, 21 days may prove too short a period of quarantine for some people’s liking. Social epidemiology. Following up on last time‘s quantitative analysis of Ebola and poverty, there was an in-depth piece this week on the role social science can play in understanding and reacting to the outbreak, particularly anthropology. On a related note, if you’re not already following Brown University anthropologist Adia Benton on Ebola, I would recommend that you do. Things here have moved really fast in the past two weeks. Fourteen days ago the primary argument was for total travel bans. As others pointed out, such bans have been ineffective for many past epidemics, including flu [pdf]. Last week there was concern regarding those returning from West Africa, leading to Syracuse University dis-inviting a journalist returning from Liberia from talking at their campus. Similarly, the BBC would only conduct interviews with returnees via phone/Skype. This led to consideration of airport screenings; generally thought ineffective. And now, since the self-diagnosis of a returning doctor in New York, mandatory self-quarantine for returning healthcare workers in three US states. Much of the concern on this topic relates to individuals infecting other prior to being isolated. The difficulty is that, while we believe that asymptomatic but infected persons are not infectious, there isn’t time or resources to conduct a rigorous study on this topic. Which provides just enough uncertainty for “an abundance of caution” (a phrase about which George Orwell would have had much to say, and typically means “I don’t need evidence to spend scarce resources on the most immediate concern confronting me”) and thus the imposition of restrictions on human rights in the name of public health – something with a long and inglorious history. To date, there is no evidence that the risk of infection from the asymptomatic (and frankly the mildly symptomatic too) is anything other than minimal. Rapid tests for Ebola, perhaps building on PCR tests, are under development, but even so, any test will require either: (a) mandatory quarantine for the potential incubation period (see above); or (b) self-testing based on temperature or a blood test for the same period – cf Rwanda’s brief foray into Ebola testing requirements. So far as I can see, whether (a) or (b) is the best plan is a judgement call based on your appetite for risk, your concern about human rights, and your trust in your fellow-persons. Hence no-one has a definitive answer. A few quick thoughts on how to get accurate messages across. The possible effectiveness of outreach by the CDC on twitter. Important, given the frequent radio silence from public health bodies, including the World Health Organization. An informed media presence is crucial in an evolving epidemic; otherwise the role falls to lesser-known scientists who have less credibility (despite having as much/more knowledge). And some words from a previous outbreak: how to present data so as not to stoke fear, by Oliver Razum and colleagues. Tara Smith‘s outline of why Richard Preston’s The Hot Zone has inadvertently misled people outside West Africa and generated more heat than light. Tl;dr: it sensationalizes Ebola in the interests of making a compelling narrative. Paul Farmer‘s thoughts on his time in Liberia in the London Review of Books. Partly because it is a very well-written first-hand account of one view of the situation in Liberia, but mostly because Farmer is so strong on linking the small picture to the large picture, the causes to the effects. I don’t agree with him on everything, but there aren’t many people out there thinking so deeply about important aspects of public health. One thought that really jumped out at me (from among many): are all the emergency treatment units going to contribute anything towards rebuilding society in these countries; and could we adapt them so that they do? Ebola Deeply is a really nice site founded by two foreign reporters (one with extensive West Africa experience) and a media entreprenuer, bringing together sources on the epidemic. Informed reporting, a public service mission statement, whatever next? Less a journalist, more a curator of relevant and informative work, Crawford Killian’s blog is essential for keeping up with the epidemic’s unfolding path. NYU Ebola hackathon. Next weekend (1/2 November) in New York. USAID Grand Challenges. Not really aimed at epidemiology, but maybe you can find collaborators? NSF Rapid Funding. If you have a good idea, they’ll turn round a decision pretty darn quickly. Are there other opportunities out there I’m missing? If so, I’m @harlingg, thanks. Oh, and there are 4 previous posts in this series: #1, #2, #3, #4; and a summary of data/article sources. 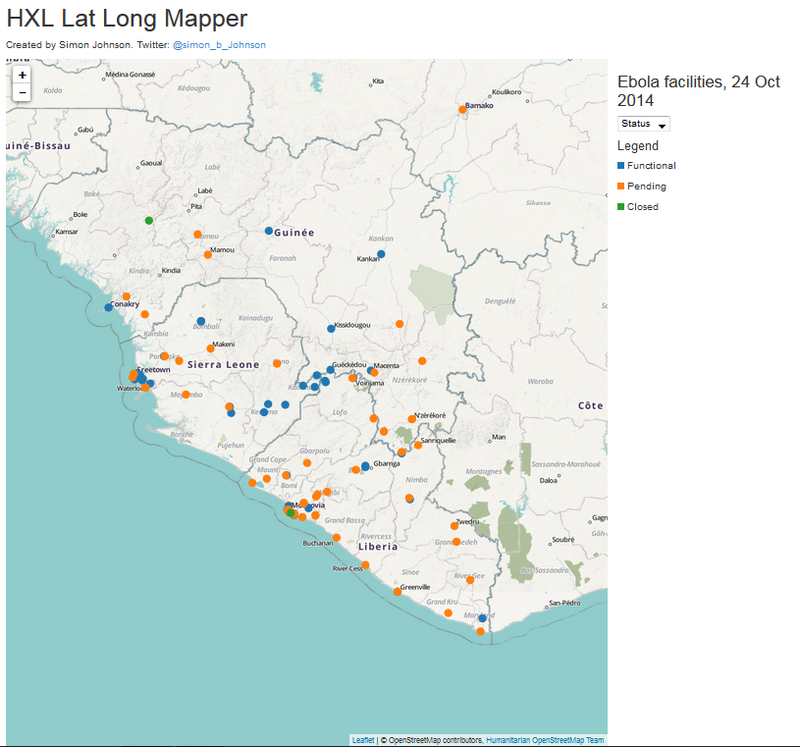 This entry was posted in Ebola and tagged ebola, epidemiology, roundup, west africa. Bookmark the permalink.